Improving? How do you know? i suppose the answer to the above depends upon the goal and how you have decided to measure it. If I want to lose weight and I am getting lighter in the scales then success? But how can you measure your improvement on the bike. You could wait for a sportive and complete this year in year and see if your times are tumbling, but this is a long time to wait and we need feedback more often, well I do anyway. There are a number of measures you can use and they will all have their benefits as well as drawbacks. 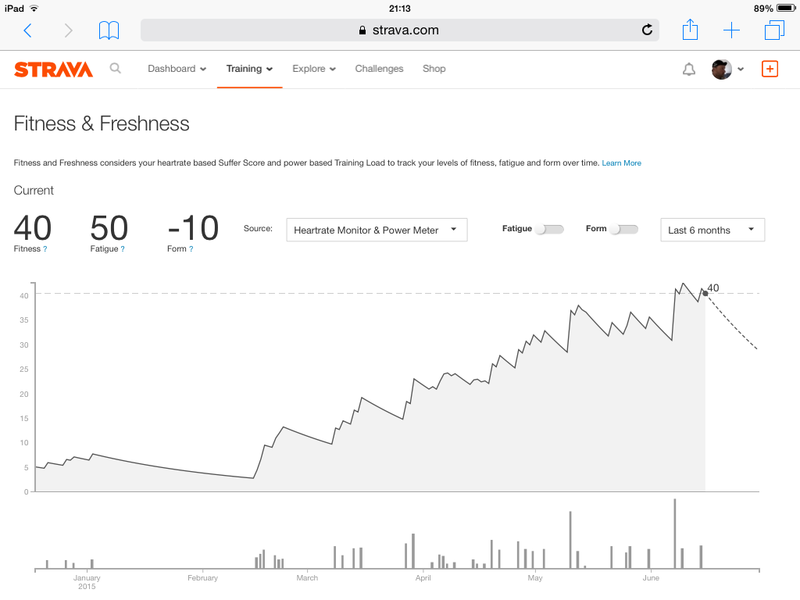 I have been using Strava’s Fitness and Freshness tool which is available to premium members. I am sure it has many drawbacks, but it is working for me and I can feel the improvement in the bike, where it counts. This is what you get! A sImple graph with a nice positive upward move the more rides you put in. You do need a HR monitor as this measures your suffer score and estimate power. If you have a power meter this will provide even more data to analyse. You cannot share this with other Starva users directly but a screenshot onto a blog post or other social media can be easy complete for those who want to do so. I have chosen only to do this for the purpose of this post as at the end of the day the day it’s used my me, and I know I am improving if the fitness number it going up over time. If you wish to use this you do have to be a premium member which doesn’t appeal to some. You will also need a HR monitor as previously mentioned. As it says in the site its best to ignore the numbers or not pay too much attention to them and look at the trend over a period of time, and if you have a positive upward movemnet you are getting fitter and probably finding your rides a little easier. I have been using this tool for about 11 months now and I find it has really helped me. Also getting out for the weekly club rides does wonders for the body, but at least with this tool from Strava as well as recording your ride you can analyse the data so see how your are improving. Whatever you chose to use to measure your progress you will be able to confirm the data as you will feel better or stronger on the bike, which in itself is a fantastic feeling! Enjoy your rides, safe cycling. This entry was posted in Cycling, Equipment, Training, Uncategorized and tagged Cycling, equipment, heartrate, improvement, strava. Hello world, I’m back again. Hello, I am aware it has been a very long time since my last post, and yest lots has happened, but I hope to be in a better position to post more often. I will be spending some time changing a few features of the blog, some of the pages might change, be deleted and new ones appear. How you can help and where your money goes. How you can help and where your money goes..
Rule #58 support your local bike shop! This is a clear rule and one which I am trying to do more and more. 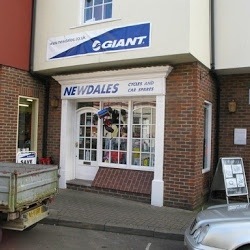 For me the local bike shop in question, Newdales in Saffron Walden, has 2 very knowledgeable staff who can answer almost any question, no matter how silly you think it is. Plus they won’t try and sell you anything you don’t need, even if you think you need it! It is a real joy to go in (to Newdales) even if it is just to purchase some new Zero table or a few gels for the weekends cycling and have a chat with the staff, when they are not to busy. They will always make time for their customers and have an excellent ability to give you the time you need to make your purchase, and the right purchase too if you are stuck, as well as get the wide range of bikes repaired and serviced which come through the door. I haven’t purchased a bike from them but you can as they stock a range of Giant bikes which will suit anyone’s taste and ability. I mainly use the shop for advice on bike parts and accessories and the small repairs and maintenance I an learning myself. I do however take my stead for a service in the Autumn before winter storage and a few other times in hype year when a service is due. The thing to remember is they get booked up very quickly so you need to plan ahead as much as possible, especially for the planned services and checks. Repairs are another matter obviously. I knew about Newdales before I got into cycling as they are in the local town, but through Twitter and various cycling related websites and blogs I have managed to find other local independent cycle shops. Just a stones throw from work is another local chain in the south east, and recently opened in the next twin are a few others which colleagues have mentioned and the services they offer. What I thought was a niche market is actually quite vibrant and varied and I am glad to say these businesses seem to be benefiting from the increase in cycling in the UK and it’s growing popularity. I suppose the next job would be to brush up on my skills and open my own business, but that remains a dream at the moment. Well thankfully I am blessed to live near a local bike shop which prides itself on what they sell you and ensure to the best of their ability what you buy is right for you, and what you get for your money. Excellent customer service goes along way to ensuring repeat business. Well done Newdales you have customer service down to a T, and I know you’ll keep it up. This entry was posted in Cycling, Equipment, Training, Uncategorized and tagged bikeability, customer servive, expert advice, friendly service, Giant bikes, Giant stockist, local bike shops, Newdales Saffron Walden, rule#58. Flash wheels – worth it? One of the things that struck me when I thought about taking up road cycling was the vast range (and prices) of bikes. Mix that with two thoughts, the fear of spending lots of cash with no advantage, and the other sides spending a bit and finding you need to spend more. I was lucky to receive a second road bike as a 25th Wedding present from my wife and had a try out on a £5,000 Felt Z2 bike so mixed with my £300 Entry level Triban3 I had a thought of doing a top gear type Bike Stig road test (Full aero helmet with mirrored visor and black sky kit) but no one would believe I was any kind of stig so onto the bikes. Last week was full of highs, a massive 273km ridden in a week and my longest ride to date, 133. The joys of a Gran Fondo badge from Strava in my trophy case. 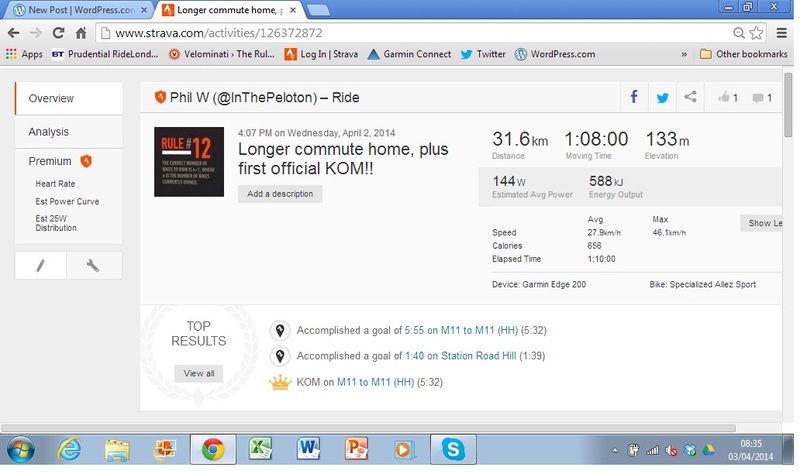 This week started well to with a second KOM on a short TT route a friend of mind set up last year. As he is now third on the list I am sure he will be working hard to regain the top spot. It was on the way home, however that the lows kicked in. I was overtaken by one car who gave me plenty of room, however the following car unfortunately did not. As they overtook me the first car braked as they approached the 30mph sign for the village, with plenty of time and space, however the second car didn’t have the space and cut in. The result was the rear of the car clipping either my front wheel or handlebars and away I went. A wobble and a shake then splat into the grass verge and it hurt. Thankfully I was not travelling at a high speed otherwise we could have been talking broken bones or there could have been a long silence if I was unable to post anything onto this blog being hospitalised or worse. The most annoying thing about the whole situation is the driver didn’t stop. I can’t say if they noticed their driving actions had caused me to leave the road and end up in a heap on the grass verge. If I was more seriously hurt then I don’t know how long it would have been before someone would have found me, this is the really scary thought. Now at this stage I am not trying to start a drivers v cyclist war, there is enough of those in the media already. The fact is BOTH cars and cycles have the right to use the roads. From a personal perspective I know that from cycling I give cyclists much more room than I did many years ago. Investment is what is required. The gutters of any roads are full of debris and stones which are just a nightmare for any tire but especially a bike. Cycle lanes help but can’t be everywhere. We also need to educate both cyclist and drivers to respect each other on the road. You also don’t see as many road sweepers as you did in my youth, no doubt to the harder economic times the councils face, but this all adds up to worse conditions for all. Of course the main problem is money. Improvements to roads and the traffic systems, cleaning the road and even providing education costs money. To add to this all the changes required will take time. Think of the use of seat belts in cars, not many if any would not use one now. However for wide spread acceptance it took legislation and time for people to adapt. The same goes for the various drink driving campaigns. Well back to me on the bike. I hope to be able to get out again soon to banish the events of earlier this week. Thankfully I was not seriously injured, which will help be get back out there. Just remember we all have a right to use the road but also have many responsibilities to obey the traffic laws and keep each other safe. Drive safe and cycle safe for the sake of everyone. Another Strava first…and I feel very proud! Congrads! You have just earned the ****** to ***** KOM. Share it with friends. This was the message I received from the lovely people at Strava, plus an email confirming the same thing, that being that I have reached the top of the pile on one of the segments on Strava. And I feel great about it! I suppose that the work I have been doing in training is starting to pay off. This was the fourth ride over two days and the aim was to give this segment a go, which worked and then enjoy the rest of the ride home. Of course, whilst it felt good and I was confident I had achieved my goal I couldn’t be sure until I had uploaded the ride from my GPS. Then, yes get in, I saw the time and the fact I had smashed my goal for the segment by 18 seconds and a massive 46 seconds quicker than my previous attempt (and then PB) earlier in the day. Over these two days i have focused on getting the average speeds up as close to 30kph as possible. I managed to get all four above 28kph which has helped be build strength in the legs which will help me on the longer rides over the next few weeks. Ideally I would like to be able to build up to rides of about 40-50km with an average speed as close to 30kph. If achieved then I know the strength will be there in time for Ride London come the summer. Then I can focus on continuing to build the endurance and the fact of being on a bike for 5+ hours. I’ve still got plenty of time to get into condition and hopefully will be able to shift another 7-8 kg of my body weight, which will help up the climbs of Leaf and Box hill in beautiful Surrey. Yesterday was also a good day as I received a text message from @onevbusyman http://onebusyman.com/ who next weekend will be running his first London Marathon. This great gentleman of distinction is the fellow I cycles with last year in the second London to Brighton Night ride for @TheBHF and we experience a sauna of a bus journey back to London from Brighton on that very hot Sunday afternoon. The great news is with the marathon nearly clear from his schedule, it means he will be a welcome addition once again to the world of cycling and the peloton of two (or however many other people we are riding with)! Sportives were mentioned and this excites me. We also have ruled out an attempt to complete London to Brighton this year but I still would like to complete this in sub four hours which was the plan last year. It will be possible without any mechanical issues. The sportives will be great fun and will be a fantastic way of clocking up the long distance rides in the final preparation for Ride London. I will take this opportunity to remind my regular reader of the reason why I am cycling all this way. I am raising money for Sue Ryder Care to help them with the fantastic work they do. Whist the training is obviously going well with my KOM achievement I will now need to turn my attention to getting the fundraising going and hitting my target of £650. Just think £5-10 from every reader of this blog will start me off with £5-10 towards my target. Every little helps! My page to sponsor me is here. Thank you!